The Sacramento Regional Transit District (SacRT) will temporarily shut down the 13th Street light rail station on Friday, June 9, at 7 p.m. until the start of service on Monday, June 12. A 30-year-old switch must be replaced as part of the system’s maintenance. The aging switch is a critical component, as all three SacRT light rail lines operate through the 13th Street Station. During the closure, the Blue Line light rail service will be temporarily discontinued between the Broadway and the Cathedral Square (10th & K and 11th & K) light rail stations. 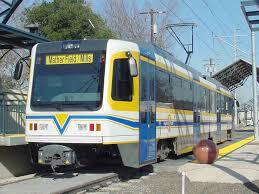 The Gold Line light rail service will be temporarily discontinued between the 39th Street and the Sacramento Valley light rail stations. The Green Line light rail service will be temporarily discontinued between the 13th Street and the 7th & Richards/Township 9 light rail stations. Buses will transport passengers between stations during the temporary closure. For a detailed bus schedule visit sacrt.com and click on the “RT Rider Alert” link. During this time, no parking will be available in the alley adjacent to the light rail station. To ensure the switch replacement is completed by Monday morning, crews will work 24 hours a day throughout the weekend. No Comment to " Service Disruptions Planned This Weekend For Sac RT 13th Street Light Rail Station "